Gringo’s Jersey City, It’s the only restaurant in town with a sawed-off milk truck in the dining room. 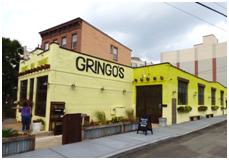 Gringo’s, the new Mexican eatery that just opened a few weeks ago in Downtown Jersey City features a sawed-in-half milk truck where Chef Rick Truocchio and his crew prepare dishes like Holy Mole tacos and Guac. Darren Conway and his partners Rebecca Tarantino, James Ventola and Chef Rick Truocchio have transformed a greasy old mechanic’s garage on Coles Street into a cavernous casual Mexican bistro with picnic-table seating, cocktails on tap; and baskets of purple maracas to shake whenever the mood strikes. 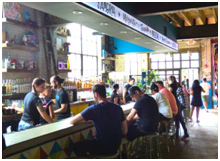 Gringo’s menu features Mexican staples like tacos and nachos with a twist. There are appetizers like Chips & Salsa, Guac, Grilled Corn Esquites, Avocado Bites, Toasted Cashew and ‘Peppa’ Hummus and chorizo and cheese stuffed jalapenos called Poppin’ Off ($6-$9). The Taco menu features the Buffalo Soldier with tempura jumbo shrimp and buffalo sauce, the Holy Mole taco with grilled organic chicken, and the We Found Nemo taco with crispy fish and mango-jicama slaw ($10-$15). Gringo’s extensive drink menu features Cocktails, Cerveza, Tequilas, Mezcal and Bebidas. The cocktails include the El Gringo Margarita, the Rubi Rosa, the Corner Bodega, Beat the Pinata, Talum Punch, Polaco, El Chapo, the Frozen Margarita (of course!) and Nacho Mama’s Sangria ($9-$12; you can also buy them by the pitcher for $39-$41). The Mezcal “Age”, “Ultimo” and Tequila are $17-$25. Frozen Margarita, El Chapo and Poloco. The restaurant seats 60 inside, 70 outside, and 18 at the bar. That’s a lot of space to mix & mingle compared to some of the smaller bar/restaurants in town. Plans are underway for live entertainment: Conway says Gringo’s will serve a Mariachi Brunch on Saturdays and Sundays in the fall. On a recent Friday afternoon, the waitstaff and crew were already serving customers at the bar and in the dining room when the doors opened at 5 pm. Tarantino and Ventola were seating guests and keeping things flowing. Partners Conway and Tarantino also own Pier 13 in Hoboken, an outdoor beer garden near 14th street; and the crew is preparing for the Grand Opening of Gringo’s Staten Island. “Darren and I have been friends a long time,” Ventola says, as he heads outside to talk to the waitstaff. “We all have different strengths,” Tarantino adds. Previous PostJersey City’s Free Summer Concert Series at Berry Lane Park: Every Wednesday 5-8 p.m. Next PostZEPPOLES, RAFFLES, DANCING— LA FESTA IS BACK!! !